Are God's Supernatural Angels Real and Who are They? · Who are the holy angels of God? · How many angels are there, and is it possible to fit the notion of cute little ‘cherubs’ into God’s description of the angels? · How can we know that God created all the angels and that they are not gods? · Do humans become angels when they die; watching over their loved ones from heaven? · Do angels cry, or show other ‘human’ emotions? · Do angels procreate in heaven? · What about female angels? · Do we all have personal guardian angels? · Should we consult, command, worship, and revere angels? · Could it be possible that Jesus is actually called Lucifer, (the light bringer or morning star,) as some denominations teach? WHO ARE THE HOLY ANGELS OF GOD? Contrary to Creation Science teachings, physical “stars” or planets did not exist when God began to form the earth, (Job 38:4-7.) This passage in Job does not refer to planets or physical stars. Additionally, we can be certain that the angels did not create heaven and earth, as some teachers also allege. Of we read carefully, it is plain to see what God declared in Job, “...I [God Himself] laid the foundations of the earth… [I] determined its measures and stretched a line upon it, fastened its foundations and laid its cornerstone when the morning stars, [not planets but those bright spirits or “lights,” the angels, who were already present with God before at the dawning of time,] sang together, and all the sons of God shouted for joy [at the marvelous completion of God’s creation. ]” Planets or stars can neither sing nor shout for joy, that is certain. These holy, or completely sinless spiritual beings, whom the God of the Bible calls “lights,” “morning stars,” or “angels,” live in heaven with Him. The Bible speaks of only one archangel, Michael, while we accept from the context of Scripture that Gabriel is the ‘chief’ or ‘commander’ of all the messenger angels. God’s angels, just as God Himself, are invisible, unless, for a specific reason, God commands them to show themselves to human beings, (Heb. 1:5-14; Acts 12:7-10.) Unlike Hollywood-films, which portray God’s holy angels as beings who long to partake in physical lusts, they are exalted high above the sinful nature and fleshy desires of humanity. 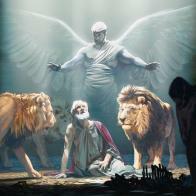 Holy, supernatural angels are the paranormal soldiers, messengers and sentries of the living God. In unseen, and for humankind mostly in unknown ways, God’s holy angels execute God’s will in every situation on earth - where and as He Alone commands. Often, in cataclysmic circumstances, they remain quiet bystanders when, for reasons unknown to us, God chooses to stay His hand from Divine intervention. HOW MANY ANGELS ARE THERE, AND IS IT POSSIBLE TO FIT CUTE LITTLE ‘CHERUBS’ INTO GOD’S DESCRIPTION OF THE ANGELS? The holy, all-powerful, angelical ‘strike force’ of Jesus Christ is neither cute, nor cuddly, nor bored. Cherubs or “bored, naughty, playful ‘baby angels;’ drifting on clouds while shooting “little love arrows” at people, (as represented by Roman Catholic/Protestant “Saint” Valentine’s day,) do not exist. These entities are demons parading as holy angels. Jesus’ angelical troops are to be respected as immensely powerful, supernatural beings, who function under the direct control of their all-powerful Commander-in-Chief, the Lord Jesus Christ. Someone asked how many angels God created, and whether God created each angel individually, or whether God simply ‘cloned’ one angel. God’s holy armies are invincible and number “more than those who are with them,” (the forces of darkness.) John wrote in Rev. 5:11-12, ‘Then I… heard the voice of many angles around the throne… the number of them was ten thousand times ten thousand, and thousands of thousands…’ The actual number of angels are never mentioned in the Bible. Still, if one thinks how majestically God created the heavens and the earth, and everything in it, it was certainly easy for God to create ‘billions’ of angels individually without resorting to ‘cloning,’ or any such sinful human technique. There is no darkness or sin in God. According to this passage, God counts the angels meticulously, and therefore, He created them individually. He knows every angel by name, (both the warriors and the messengers,) and He calls and care for each one individually. Jesus said in Mt. 26:52-53, “Put away your sword, for… do you not think that I cannot now pray to My Father, and He will provide Me with more than twelve legions of angels?” It is said Jesus referred to more than 72,000 angels! It is Scriptural fact that, originally, all the angels were created as all-good creatures of God’s eternal light and truth. To think, therefore, that God would pervert His own perfect creation by ‘cloning’ or even ‘corrupting’ the angels is simply unmentionable. However, as human populations number in the billions, I think we may believe that God created billions of angels to minister to us all. Only God is omnipresent. Angels are not ever-present but restricted to one place at a time. HOW CAN WE KNOW THAT GOD CREATED ALL THE ANGELS AND THAT THEY ARE NOT GODS? DO HUMANS BECOME ANGELS WHEN THEY DIE; WATCHING OVER THEIR LOVED ONES FROM HEAVEN? God created the angels as a totally different species from humankind. While humans are living on earth, they must remain in their physical bodies, and all of them are “lower than the angels” on God’s creation-scale, (Heb. 1:7,14; 2:6-7.) This means, holy angels are citizens of the ‘higher or spiritual plane’ and therefore, they are of a different ‘substance’ than physical human beings, who are citizens of the ‘lower world’ here on earth. As a result, Jesus, the only Creator God, created all the spiritual ‘lights’ or angels first. Then, He focussed on making humanity as the crown of His physical creation here on earth to manage all the animals, insects, trees, plants, etcetera. DO ANGLES CRY, OR SHOW OTHER ‘HUMAN’ EMOTIONS? I am aware of the fact that holy angels do have emotions such as holy joy, (Job 38:4-7,) which has nothing to do with the hysterical, unholy, and ungodly laughter that manifests among Charismatic believers, (Lu. 15:10.) Angels also worship, make music in heaven, and sing songs of praise to God, (Rev. 5:8-11; 7:11-12.) Angels are also inquisitive about the holy revelations of God, (1 Pt. 1:12.) However, when I researched the notion that holy angels cry, I could not find a single Scripture to verify such a possibility. Where Scripture states that angels cried with a loud voice, etc., it does not mean they were crying tears but instead, they were shouting out loud. In Rev. 21:4, John clearly tells us that, in God’s heavenly kingdom, no one, (neither God Himself, nor holy angles, nor the human spirits of the deceased in heaven,) ever weep – or suffer, or die. The truth of Scripture refutes teachings that equate human emotions, frailties, and especially sinful actions to God’s holy angels, turning them into emotional beings who cry, giggle, laugh hysterically, play pranks, etcetera. Angels are inhabitants of God’s ‘higher or superior’ spirit world. It is most presumptuous to perceive God’s holy angels in human terms. God warned us not to be “proud and think above that which is written… [which] makes us differ from one another [in belief and Scriptural doctrine,]” (1 Cor. 4:6-7; Heb. 2:10.) When we meet angels who show unholy or human emotions like crying, and do unscriptural or unholy things, we can be certain we have encountered unholy angels. Then, one day, while I was tearfully speaking to God, an angel suddenly stood beside me. I could not see him, but I ‘knew’ or ‘perceived in my spirit’ that he was standing next to me. Strangely, he did not startle me. It seemed as if he had been there all the time, but solely for my benefit, chose to reveal his presence at that specific moment. His presence was awesome, but amazingly, I was not afraid. As my human spirit (1 Ths. 5:23) perceived what was happening, it did not enter my mind that the angel came to ‘take me home’ as I have requested of God. Instead, I thanked God for sending the angel, expecting him to deliver a special message or bring some form of encouragement, but he did not utter another word. He did he attempt to reach out to me, or comfort me. He was neither sympathetic nor apathetic. He was not aloof, yet not emotional either. He just stood there like an immovable anchor in a dark and stormy sea until the peace of God flooded my distressed soul. I slowly realized that the angel did not come to show allegiance to me personally, but to show his continual protection over me in obedience to God alone. Clearly, God did not command him to bring me a prophecy, remind me of Scripture, or to fly me off to heaven. The angel simply manifested his presence to emit the greatness of God, Who has always been, and Who always will be in complete control of everything we might experience in this life. That day, the angel did not remove my terrible affliction. He did not lift me up to carry me over the raging seas. Yet, in some unexplainable, marvelous way, his mere ‘physical’ presence did a great miracle for me. God’s healing finally began to crack the cage incarcerating my deeply wounded soul, that day when His angel revealed himself to me. Regardless of the tendency among traditional church denominations to deny the manifestation and even the existence of angels (and demons,) it remains a Scriptural, as well as a practical reality that spirits do appear, speak, and propel many of the thoughts and actions of human beings. DO ANGELS PROCREATE IN HEAVEN? This person must read the Bible. In Mark 12:25, Jesus spoke on the marriage covenant; He did not say that angels are male as well as female and multiply themselves. Jesus’ discussion in Mt. 12:25 centred on the question whether husband and wife will continue their marriage covenant in heaven. Jesus refuted this belief, because born again human spirits will be “like” angels, who "neither marry, nor are given in marriage," because neither angels nor departed human spirits procreate in heaven! Jesus did not say that born again believers will become angels in heaven. He said they will become “like” supernatural angels in heaven, therefore they will not marry or have any need of a marriage covenant! Are God’s Supernatural Angels Real and Who are They?